I only spent two days in Uluwatu, Bali but I really enjoyed my time there. The scenery really is stunning and there’s a lot of beautiful Cliffside views and places to watch the sun go down over the ocean. The first thing to mention about Uluwatu is that this is not a walking spot. Most places are pretty spread out and the roads don’t have sidewalks, or streetlights – and due to the hilly topography of the area, the roads are super winding. So I would not recommend walking anywhere for your own safety. To get around, like most places in Bali, hire a scooter – they’re really cheap and make getting around so easy. I can’t drive (at all) but they’re super-easy to get the hang of. Just drive slow and wear a helmet and you’ll be fine. My housemate who I was travelling chose not to ride a bike for personal reasons and found that taxis were VERY expensive here (around £6 for a 5-minute journey which is ten times the usual prices in Bali), and there’s no Uber. But if you don’t feel comfortable on a scooter then at least you can get taxis, just try and split the fares to make it more economical. My boyfriend and I stayed in the Waroeng Surya Homestay which was a 5-min drive from Single Fin, a 10-min drive from Padang Padang beach and a 4-min drive from Uluwatu Temple. So pretty well-located for anything you might like to do in Uluwatu. The room was large with great air-con and a little outdoor area going out onto the pool. The free breakfast was really good too. 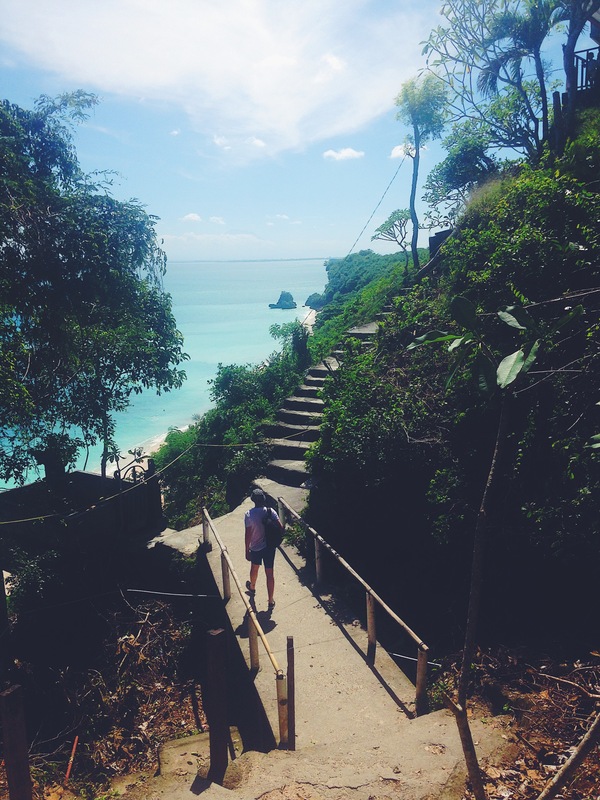 Go to Padang Padang beach – it was probably the prettiest beach I saw in all of Bali. There’s not much to say about it except that, but it’s definitely a must-see. I had a great day there drinking beers and listening to my portable speaker – but you can also do surf lessons there. Apparently it’s also the beach that’s on Eat Pray Love (but I’ve never managed to get through more than 30 minutes of that film so I can’t confirm). Single Fin is a cliff-side beach bar which seems to be the most happening place in Uluwatu and it offers stunning views over the ocean to watch the sunset. Be warned, it gets super busy so I’d advise reserving a table. The food is so-so, as are the drinks, but it’s a great atmosphere. Uluwatu Temple is a must-do in Bali and you can watch a nightly fire-dance there and see monkeys – unfortunately I missed the dance as I’d lost my friend (long story, broken phones) but I hear it’s amazing. And there’s monkeys in the temple too. All in all, Uluwatu is beautiful but there’s not as much to do as other spots in Bali like Canggu, Ubud and Kuta. But it’s worth going for the gorgeous beaches and if you want a few days to just chill. Bali , is heaven isnt it 🙂 follow for a follow?